Synchrony Bank provides its customers with a variety of high-earning savings accounts from CDs to IRAs. As you’ll see, its rates climb well above the national average and perform much better than big banks’ accounts. With high interest rates and no maintenance fees, you can grow your money for as long as you want without losing anything to fees. Synchrony operates entirely online, save for its single location in New Jersey. However, Synchrony’s online banking experience is robust, making its products and your accounts easily accessible. Synchrony Bank is a subsidiary of Synchrony Financial, which is headquartered in Stamford, Connecticut. The company has roots tracing back to 1932 when it was General Electric (GE) Contracts Corporation. After years of growth, the bank separated from GE Capital and went public in 2014. It’s traded under the stock symbol SYF. Synchrony Financial has over 15,000 employees and more than $51 billion in deposits across its savings products including CDs, savings and money market accounts. One of the ways Synchrony distinguishes itself is as the largest private label credit card company in the U.S. based on purchase volume and receivables. Starting with GE credit cards in the early ‘70s, then moving on to Lowe’s credit cards in the late ‘70s, credit card partnerships have increased over the last 40 years. Private label partners include Amazon, Walmart, Sam’s Club and Toys “R” Us, among many more companies. While that’s what the company’s best known for, it also serves millions of customers with its savings offerings. Synchrony Bank offers high yield savings accounts, money market accounts and certificates of deposit at competitive interest rates. With Synchrony Bank, you can build your savings with a variety of products. Savings opportunities include certificates of deposit, high-yield savings and money market accounts. You can open one type of account, or even one of each if that better suits your financial needs. Minimum Account Balance No minimum deposit to open and no minimum balance to maintain. Access to Your Savings Online, mobile, ATM card, via phone or electronic transfer. Security FDIC insurance up to the maximum amount ($250,000) allowed by law. If you’d like to put aside money while still having easy access to it, a savings account is one of your most obvious options. This popular method of saving can help you build future wealth while still keeping your assets liquid in case of an emergency or other need. Most individuals have at least one savings account, and there are those who have multiple accounts. Whether you’re saving for a holiday trip, education costs or an emergency fund, a savings account can be used for anything. The biggest drawback is the low interest rates that are offered in exchange to the easy access to funds. Synchrony Bank offers a high yield savings account advertised with savings rates well beyond the national average. While you won’t make a fortune with savings interest, it can grant you some additional funds - at the very least more than a checking account which typically earn no interest. You can open an account with any amount of money at Synchrony Bank. If you want to make the most of the interest rates, you will want to keep a decent chunk of change in the account, but there is no minimum account balance. That means if you need to withdraw almost all your savings, you can, and the account will still stay open for your future use. To deposit funds in your account, Synchrony has a mobile app for mobile check deposits, direct deposit authorization and internal transfers. You can also send a personal or cashier’s check, or wire funds from a separate sending bank. And for those who still use snail mail, you can send a check through the mail for deposit as well. Similar to deposits, you can withdraw or transfer funds by the same means: checks, wire transfers, internal transfers or request a check. Outgoing wire transfers do incur a $25 fee, so if you want to save money, you can transfer online or through the phone. In addition to those methods, you can withdraw your money using an ATM card. You’ll need to keep in mind that you’re only allowed to withdraw or transfer six times per billing cycle as per Federal regulation. If you go over six transactions, Synchrony won’t charge a penalty fee, but the bank reserves the right to close your account. Synchrony Bank accounts are insured by the Federal Deposit Insurance Corporation (FDIC) up to $250,000. Most banks offer this coverage, and it insures that you will still keep your money in the event Synchrony Bank fails. Access to Your CD Online, mobile or phone automated access. Fees No transaction fees, but there are penalties if you choose to withdraw from a CD prior to maturity. Curious what the difference is between a certificate of deposit (CD) and a savings or money market account? It comes down to liquidity. CDs lock your money up for a certain amount of time, but come with the benefit of a higher interest rate. It’s a stable but low yield investment. You can make the most by depositing a larger amount of money for a longer period of time as that will garner you the highest interest rates. However, there are several different strategies for maximizing CDs. One of the most popular is a CD ladder. The idea behind this strategy is to not lock up your money for too long of a period, so you buy several CDs of varying term lengths. Whatever method you choose, know that if you do need access to your funds prior to the end of the term, you’ll be charged penalty fees. With Synchrony Bank, the lowest amount you can invest in a CD is $2,000. You’ll have 10 days from the open of the account to fund it either through transferring funds, sending a check or wire transfer. After 10 days, you can’t add money to the CD. You can always open another CD, but not add to an existing one. Synchrony bank offers terms as short as three months, which offer the lowest interest rates, but allow you access to your money after only a short period of time. Synchrony Bank guarantees CD rates for 15 calendar days after the opening of the account. This means if the rate decreases after you opened the account, you’ll still get the higher interest rate. And if the rate increases, Synchrony will give you the higher rate. Once your account is funded (you made the initial deposit), you’ll start accruing interest each month. You’re allowed to withdraw the interest — penalty free — at any time. You can keep it in the CD or transfer to another Synchrony account, an external bank account or you can request a check. Minimum Deposit No minimum balance or monthly service fee. Access to Your Money Market Account Online or mobile, ATM or check. A money market account is very similar to a savings account. The biggest differences between the two are actually behind the scenes on the bank’s end. Banks can market and use money market funds differently than savings account funds. But on the consumer side, a money market account is almost completely the same as a savings account. You can deposit as much money as you’d like into the account and with Synchrony Bank your funds are insured by the FDIC up to $250,000. As with a savings account, you’re limited to six transactions per monthly statement. Those transactions include withdrawals and transfers. The old rule of thumb was that you could earn a bit higher interest with a money market account versus a savings account. However, that’s not applicable in today’s market where you can find many savings accounts that offer more interest than a money market. So you be wondering, what’s the point of a money market account? Think of it as another savings account option. If you keep an eye on interest rates, you can choose whichever savings product is the most advantageous to you. Access to Your Account Online or mobile, ATM or check. If you’d like to use a money market account in a retirement savings capacity, you can open a traditional or Roth IRA money market account at Synchrony. You’re allowed to make additional deposits at any time (up to the maximum allowed by law per year for the type of retirement account you choose). The interest is much lower than what you’d potentially earn with a stock portfolio or other investment, but your savings are protected by the FDIC. You can transfer funds or a retirement account from another financial institution, or roll over an employer account if you’d like. Minimum Deposit $2,000 for three months is minimum amount and the shortest term. You can make additional contributions during grace period after the CD maturity date. Access to Your IRA CD Online, mobile or phone automated access. At Synchrony Bank, you can choose to open a traditional or Roth IRA CD. If you already have an employer or self-directed IRA, you can roll it over to Synchrony if you choose. While a purely CD-driven retirement portfolio won’t earn you much interest, it is protected by FDIC insurance. This differs from stocks and other investment accounts which don’t have protection. The rates and terms offered for IRA CDs at Synchrony are the same as its regular (non-retirement) CDs. You can make additional contributions to your IRA CD during the grace period after the CD reaches its maturity date. Where Can I Find Synchrony Bank? Synchrony operates almost exclusively online. It does have one branch location that is in Bridgewater, New Jersey. However, you can reach representatives by phone Monday through Friday from 8 a.m. to 10 p.m. and Saturday 8 a.m. to 5 p.m. Eastern Time. Automated telephone service is available 24 hours a day, seven days a week. And you can log into your account online at any time. What Can You Do Online With Synchrony Bank? Synchrony has invested in the online experience for its customers. You can access, monitor and execute transactions online at any time of the day. You can also use the mobile site, which offers the convenience of mobile check deposits. That feature saves you from mailing in checks, or adding in the step of depositing in another account to transfer to your savings account. If you want to explore your savings choices, Synchrony’s educational content is enough to give you a foundational understanding. The frequently asked questions section is pretty extensive and will address many of the questions you may come up with. You can also compare interest rates and products across the site. Synchrony also ranks its interest rates compared to competitors — but beware, it’s not the full picture. 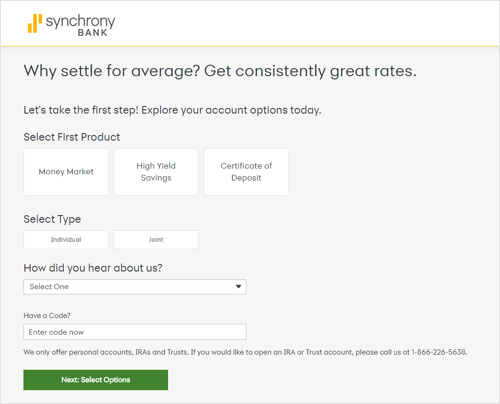 You’ll notice that Synchrony always comes out on top for best interest rates on the site, but not all banks are included in the comparison. And once you’re ready to open an account, you can complete the process from start to finish online. All you need is the necessary information to get going. Money market and savings accounts are allowed six transactions per month. This includes withdrawals or transfers. This limit is a requirement by the Federal Reserve, not the bank itself. If you find yourself needing access to the money more often than that, you’ll need to change the account over to a checking account at a separate bank, or risk having your account closed over misuse. With Synchrony, you can access your account online or through mobile and transfer funds to an account you’ve added at any time of the day or night. The automated phone system is another way to access your money if you don’t have access to the internet. And you always have the option for a wire transfer, although it’s accompanied by a fee. If you want to speak to a bank representative, you’ll need to call the number listed on the contact page of Synchrony Bank. Additionally, Synchrony offers ATM cards which come with a $5 reimbursement per statement cycle for withdrawal fees at unaffiliated ATMs. You can withdraw up to $1,010 per day out of your Synchrony Bank account. As for CDs, you can monitor your maturity date and overall accounts online or on your mobile device. You can always call, as well. Since CDs operate in term lengths, you won’t be able to withdraw principal (your deposit) until the term is up without incurring fees. However, the interest you accrue can be accessed at any time without penalty. Similar to savings accounts and money market accounts, you can transfer your interest money to an external or internal account, or send a check to the address on file. How Can I Save More Money With a Synchrony Bank Account? First of all, if you keep a large balance in your checking account or have a large pile of money in an account that yields a fraction of a percent of interest, you have room to improve your savings. While savings accounts, CDs and money markets are low interest ways to grow your savings, it still beats the 0% interest you earn with a checking account. The same with a stockpile of cash. If you happen to be hoarding money, you can always deposit those funds into a savings account or money market and have liquid funds that will earn you more than dust over time. As for how much overall you can save, it all depends on how much you deposit and for how long. You stand to earn the most with CDs, but that comes as the cost of losing easy access to your funds. You’ll also earn more interest the more money you put into an interest bearing savings account. It all depends on how much money you need on hand, and how much of your paycheck you’re stashing away for retirement, but to set yourself up for future financial success, you can’t neglect opening a savings account. What’s the Process for Opening an Account With Synchrony Bank? You can open an account from the comfort of your home by registering for a customer login ID. The start of the online process, shown here, requires you to simply choose the type of account you would like to open. If you don’t want to apply online, you also have the option to call and apply over the phone. For those who like paper and pen, you can request a paper application be sent to you. If you’d like to print an application yourself, you can find the PDF form and print and mail it in yourself. The quickest process is generally online. To get started, you’ll need your Social Security number as well as a driver’s license, state identification number or military ID. You’ll need to provide your physical address, occupation and employer and the source of funds you’re planning on using to open the account. If you’re planning on transferring funds from a current bank account at a different bank, you’ll need the routing and account number. Once the account is open, you can monitor it online or through a phone call. Savings accounts really don’t have an obvious catch other than relatively low interest. It’s a safe way to make a little extra on any money laying around, without locking up your funds in a different type of account. And while the rates are not bad at the moment, they’re subject to change at any time. Savings and money market accounts don’t include a rate lock. You’re subject to market fluctuations over time, which is the tradeoff for easily accessible funds and no fees. CDs on the other hand are better to earn interest with, but you sacrifice cash on hand. And with Synchrony, the lowest amount you can invest is $2,000. The good news is that three-month terms are offered, which are some of the shortest available. You won’t earn much interest in that short of a time span, but it’s good news for anyone concerned with liquidity. While Synchrony is mobile-friendly and has an easy-to-use website, it does lack in person locations. If you still prefer speaking to someone in person, you may want to look at banks with retail locations. But if that’s not a big concern of yours, you should be fine with Synchrony’s wide availability of communication. You can access your funds in at least two or three different ways at all hours of the day, which is very convenient. The bank also offers mobile deposit, which isn’t offered by every bank. Synchrony Bank’s foray into savings accounts can be beneficial to consumers willing to take advantage of competitive rates. The company offers some of the highest competitive rates for savings accounts and CDs. While some consumers may prefer to keep all retail banking at one institution, Synchrony does make it easy to open and maintain an account. Mobile friendliness and mobile deposits are two big headaches the company smooths out with its system. Accessibility is also addressed with account access at any time of day or night. As with any savings account, you’re not going to make a huge amount of money — the interest rates just aren’t that high, and you can make more with other investment vehicles. But if you want a safe and easily accessible place to save for a future purchase or emergency fund, you won’t go wrong with a savings account. FDIC insurance backs the accounts, so you’ll always get your money back. And with Synchrony offering ATM cards (something a Goldman Sachs account lacks), you can grab cash on the go if needed.